What is eAssist on GM Vehicles? Home » Buick LaCrosse » How Can eAssist Help Fuel Consumption? How Can eAssist Help Fuel Consumption? The big news in the last few months has been the release of eAssist technology on a limited run of the 2016 GMC Sierra and the 2016 Chevy Silverado. But what is eAssist? 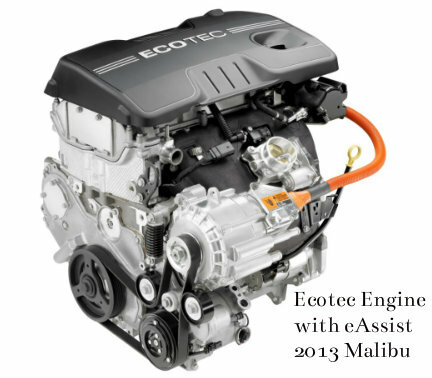 First appearing on Buick and Malibu sedans, GM eAssist technology is a combined gas and electric powertrain system which allows eAssist-equipped GM vehicles to offer exceptional fuel consumption without compromising on performance. Keep reading for a breakdown of some of the eAssist efficiency technology that we will see in the 2016 Sierra and future eAssist cars, trucks, and (hopefully someday) SUVs. The beauty and genius of eAssist is how it combines both a traditional gas engine and an electric motor, and reaps the advantages of both. In the 2016 Sierra with eAssist, for example, a 5.3-litre V8 engine matched to an eight-speed automatic transmission will work with a compact induction motor to provide top efficiency without compromising on horsepower or torque. Indeed, the motor functions like a electric torque booster, and can add up to 44 pound-feet of torque and 13 horsepower to the already impressive engine performance, when that extra oomph is required, like when accelerating or passing. Thanks to efficiency technology like direct injection, variable valve timing, and cylinder deactivation (which allows the engine to run on fewer cylinder when they are not needed for towing or hauling), the eAssist V8 on the new Sierra is already extremely efficient, but the electric motor can even add to that. Electric power boost means that the electric engine can take some of the load at certain times, allowing the gas engine to continue operating more efficiently with fewer active cylinders. The motor will be powered by a lithium-ion battery pack. In the case of the new Sierra with eAssist, this battery back will add just over 45 kilograms to the vehicle’s curb weight, but will offer significant reductions in fuel consumption, especially in city driving. Thanks to this battery pack and motor, the 2016 Sierra will be equipped with Stop/Start capability, which will allow the engine to shut down at a traffic light, or in the rush hour crawl, and seamlessly restart once the driver takes his foot off the gas. Regenerative braking is another major advantage offered by this powertrain. With this advantage, energy lost when braking is turned into electricity that can recharge the battery and help run the electronic of the vehicle, like the lights and the radio. Many of these eAssist technology pieces have been available previously in other GM vehicles like the Buick Regal, Chevy Malibu or the Chevy Bolt, but we are extremely excited to see these fuel-efficiency advantages appearing on the great Sierra and Silverado trucks. Contact a member of our Craig Dunn Motor City team today to learn more about this technology on vehicles that may arrive on our lot in the future. This entry was posted on Monday, March 14th, 2016 at 8:09 am	and is filed under Buick LaCrosse, Buick Regal, Chevy Malibu, Chevy Silverado, GMC Sierra, New Vehicles, Technology. You can follow any responses to this entry through the RSS 2.0 feed. You can skip to the end and leave a response. Pinging is currently not allowed. Hi! Just wondering if Eassist feature can be deactivated? I own a 2017 Gmc Sierra with Eassist and would like to deactivate. Does e assist come on the 6.2 motor ? ?